Till 2018, it was perhaps due to his ODI exploits that Shikhar Dhawan continued to enjoy a free ride in the Indian T20I side. A blossoming bonhomie with Rohit Sharma and an unmatchable swagger made him an essential presence in the shortest format of the game, but also one with little impact. When KL Rahul fired on all cylinders in the IPL for Royal Challengers Bangalore, there was this inherent feeling that Dhawan was on the verge of losing out on a place in the T20 team sheet. He was even denied the captaincy of his IPL team franchise Sunrisers Hyderabad in 2018 after David Warner was out of the tournament with Kane Williamson becoming the only foreign skipper in the 2018 season. Despite his ODI form which was still irresistible, Dhawan in T20s seemed a liability but there was never really any doubt regarding his capabilities in the format for he had every quality desired in a T20 opener. But 2018 turned out to be a breakthrough season for Dhawan the T20 player. He smashed 497 runs in 16 matches in the IPL, making an appearance in the top 10 run getters in the season and prolonged his form in International cricket. An average that lurked below 30 till 2016, has shot up to 39.5 in 2018 with steady progress in the last three years, the third of which culminated in some breathtaking form with his strike rate also considerably going up - from 117.1 in 2016 to 141.9 in 2018. He was hitting a lot more boundaries as well and has already racked up 1000-plus runs in the format this year across competitions, a first in his T20 career. What's more? He has topped the run charts at International level too with Rohit Sharma, whose shadows he cloaked himself in before 2018, coming second-best. Dhawan has not only found the right pace that works for him in this format but also learned the art of carrying on from his starts. It hasn't resulted in big hundreds yet like his opening partner but that transformation is in the offing going by the way he has made runs this year. In all but one T20I series this year, Dhawan has scored at an average of 35 or more. The one in which he failed was in England, a miserable series where he made just 19 runs in 3 matches. But that was a rare anomaly in Dhawan's otherwise stupendous year. In South Africa he piled on 143 runs in 3 matches at an average of 47.66 and followed it up with a great Nidahas Trophy where he hit two half-centuries in five games and averaged nearly 40. In the lone T20I he played against Ireland, Dhawan made 74. In the last two series’ this year - against West Indies at home and Australia last week - Dhawan has averaged 46 and 58.5 respectively with his outrageous form hitting a zenith Down Under where he made runs at a strike rate of 182.81. At the Gabba and Sydney, Dhawan's manner of attack complemented Rohit perfectly. He was off to a flier on both occasions, scoring 42* off 25 balls in the powerplay at Gabba and 41 off 22 in the first six at SCG. He was dismissed off Starc at SCG before he convert it to a bigger score but made it count at the Gabba, adding 34 more in the next 17 balls he faced after the powerplay. That he has matched up with the other openers of current T20 generation is evident from a comparison of numbers between him and other T20I openers in two time frames - one from his debut till 2018 and one after 2018. The below table compares his numbers to that of other openers in these separate periods (the better number is marked in green). While this is an opener to opener comparison, Dhawan's exceptional 2018 for India in the shortest format is evident when you compare his individual scores this year to that of his other mates clubbed together. For this, we consider the average runs/batsman the India team has scored in each of the 18 innings' they have played with Dhawan in the side and match it to Dhawan's scores. 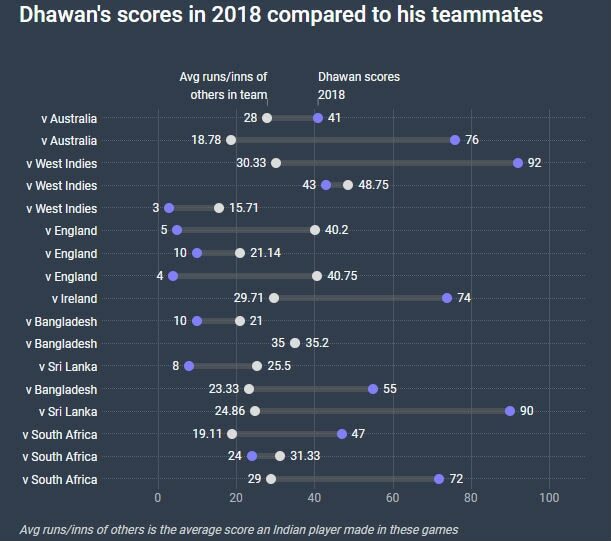 If Dhawan has scored better than his mates, his numbers would appear on the right hand side of the chart (in violet) while a lesser average score (in grey) means he has performed below par in comparison to his mates. The vast difference between the violet and grey dots in some of those scores prove just how good Dhawan has been for India in this format this year. 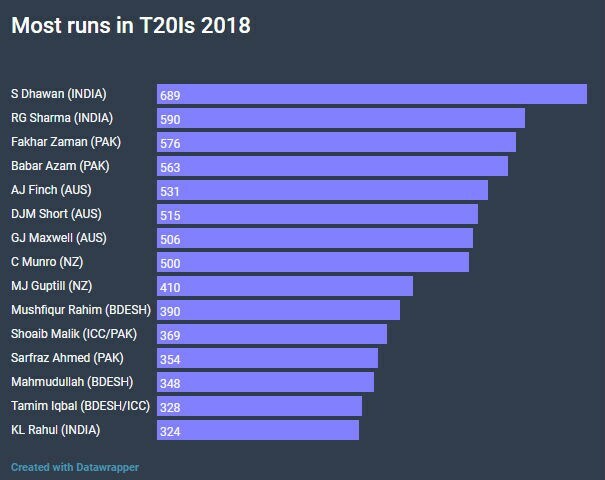 That he has outperformed two of the most prolific T20 players of this generation - Rohit Sharma and Virat Kohli - is an indication of his growth in T20s. The move to Delhi in the IPL has perhaps come at an opportune time for Dhawan who is hitting his peak. The Sunrisers Hyderabad have made some smart calls in recent times in the IPL market but letting go of Dhawan 2.0 is perhaps a decision they would rue next March. 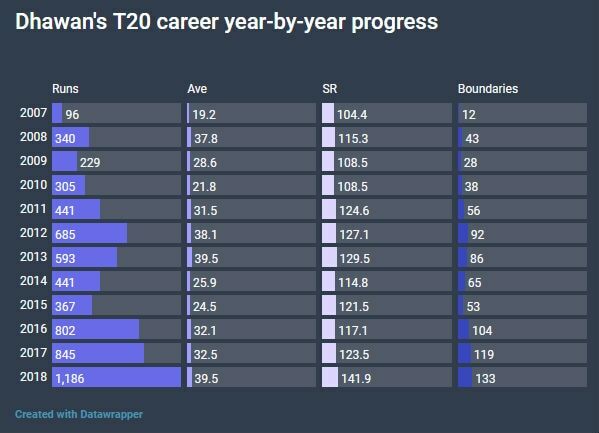 CricViz Analysis - Are India Selecting their Best T20 Team?